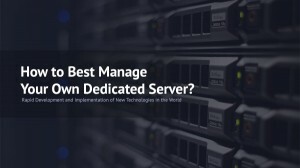 ScarabWeb.com - How to best manage your own dedicated server? Rapid development and implementation of new technologies in the world provides society with a wide range of opportunities for running different business ideas. This is why it’s very important to consider the basis needed for that in details. Widespread of e-commerce allows thinking about a place for hosting company’s resources. A purchase of a dedicated server becomes an attractive solution in such terms, especially when traffic associated with the business has risen sharply and downloading data takes too much time. But the purchase itself is just an initial step in such a delicate matter as the more important question of what is the best way to manage this dedicated server. Choosing between managed or unmanaged dedicated server is an important step to evaluate own capabilities to manage it personally or trust with a qualified team in this question. Most of people might say it’d be better to go with an unmanaged dedicated server, especially those who prefer saving as it wouldn’t require spending additional funds on someone’s efforts to administrate the server properly. However, further pitfalls may appear soon like protection of the data from malicious activity, grant of the back-ups in case of force majeure, as well as spend money and time to be sure the server runs reliably, etc. In these terms, managed dedicated servers appear in a winning solution as they don’t require much maintenance from the owner of the server. A managed dedicated server doesn’t require hiring additional employees to support it while it’s more easier to rely on the hosting provider that will be dedicated to this server and will do all the best to run it reliably. Another benefit of an unmanaged server is that 24/7 support is always ready to assist in issues with operating systems, software licenses, updates for said software licenses, storage maintenance of the server and others. With an unmanaged dedicated server, the owner will have to deal with all this personally, which requires not only additional investments but time also. 1. Removal of almost all the physical costs associated with the server. 2. Better server reliability and performance. 3. Efficient technical support and emergency.